In a time when death is common, life is cheap and superstition rife, anyone can find their world torn apart by gossip and accusations. Can one lonely girl find the love and companionship she craves? Or will her heart lead her into more danger than she can imagine? Lizzie Prentice, daughter of a cunning woman, is no stranger to scandal. She carries it with her, like the scar on her forehead. Samuel Pendle, her protector since childhood, could hold the key to a normal, safe life. But when Samuel defies his parents, it seems that history is bound to repeat itself and Lizzie’s life is at risk. 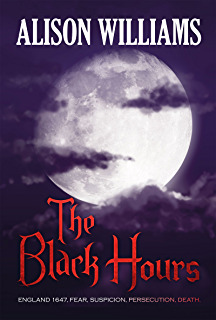 ‘Blackwater’, prequel to the historical novel ‘The Black Hours’, follows Lizzie as she strives to escape the same terrible fate her parents suffered; her life thrown into turmoil, and everything she holds dear at stake, but determined to find happiness in a world of intolerance, cruelty and hate. 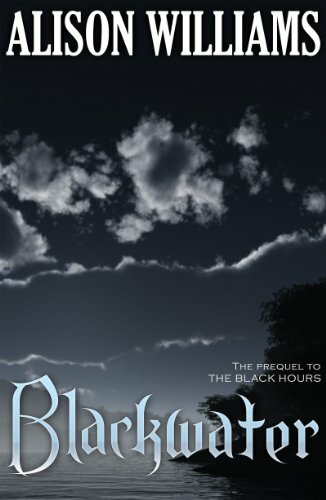 Please note that although Blackwater is the prequel to The Black Hours: http://amzn.to/2kHc2QJ , both can be read as stand-alones. Initially I didn’t realise Blackwater is the prequel to the Black Hours but it honestly didn’t affect my enjoyment of the book..
Set in 17th century rural England, this is a well researched Historical novel by Alison Williams. Although the book is a slow starter it’s worth persevering for a couple of chapter as it then takes up a head of steam that will carry the reader right the way through to the end. The harshness of everyday life, the disregard for life, the superstition and ignorance rife within small villages in those times, is emphasised throughout and runs parallel to the touching love story. There is a great sense of the era. The characters are well drawn and rounded. Both Maggie Prentice and her daughter Lizzie are given excellent back stories that filter through to their present lives and foreshadows the inevitability of their future despite Lizzie’s relationship with Samuel that is so sensitively written. With the dialogue, there is never any misunderstanding who is speaking; each character’s voice has a timbre and syntax that is unique to that character. I loved this author’s style of writing. Her attention to even the smallest detail draws many images on the page in this dark and enthralling story. This entry was posted in blogging, Book Reviews, Books, contemporary womens'fiction, historical, historical fiction and tagged #women, books, history, Reviews, writing by Judith Barrow. Bookmark the permalink. Thanks for this review, Judith. I’ve read the Black Hours and liked it – so now I’ll have to read this! Thanks, Noelle. I do like Alison’s writing style. I realised a long time ago that, if I like an author’s style of writing, I can forgive a weakness in a plot. So when I come across a great plot AND a great style of writing… well!!! Wonderful!